I recently surveyed Facebook users for ideas on articles – and the following series is in planning. If you would like to contribute or suggest other topics, please contact me. The eye article has certainly generated the most votes, so that has now been expand into the following extended format, and consequently will take sometime to get together. 2 – Clumber form and how that dictates the eye shape, so we have skull structure, musculature around the eye, impact of muscle tone on eye shape, and skin (it is rather heavy) and tone of skin, so here we can introduce haw; and how this structure can be of use in the field; also discuss how eye shape can change with age. Also, disease and trauma and transient expressions of ent/ect/small eye openings. In all cases I will be looking for interviews/comments/article editors/leaders! 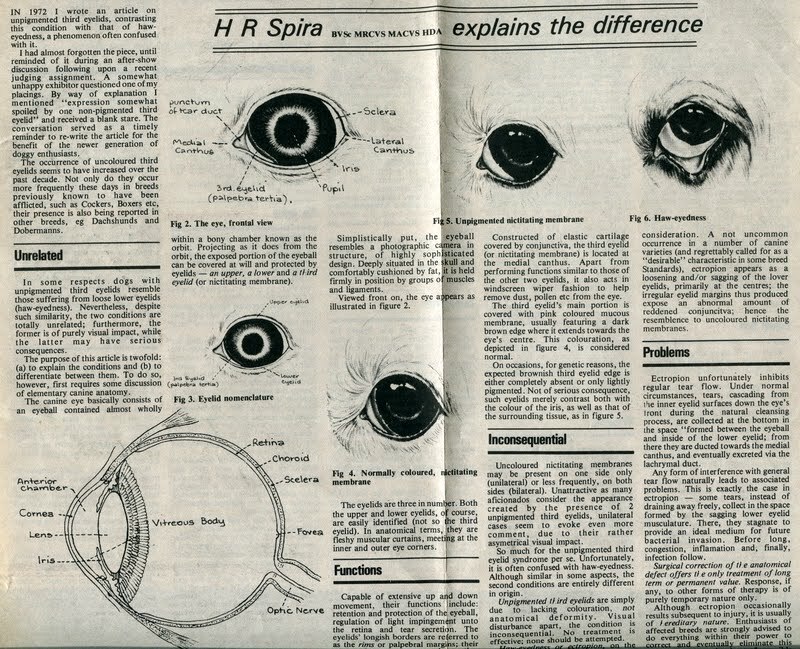 As an adjunct to the feature on eyes, please see this article previously published in the UK’s Dog World, by the late Dr Harry Spira, it covers Haw.